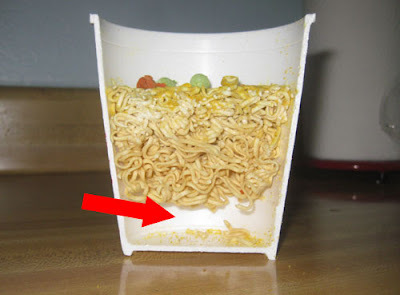 Mystery #1: Why is Cup Noodles Triple-Wrapped? Mystery #2: How is One Supposed to Close the Lid? Mystery #3: What Happened to the "OF"? It's an interesting little write-up, though I can't say that I'm surprised about anything. My Answer to Mystery #1: The paper seal at the top is to keep the contents in the cup, the plastic wrap is to keep all of the contents fresh, and the paper vest adds some needed vanity to the product. Cup Noodles is not the only brand to do these things. In fact, I would say that most cup noodles and bowl noodles are triple-wrapped. My Answer to Mystery #3: Noodles expand when they are cooked. Some space at the top and bottom is necessary. Take a look after you're done cooking the noodles. Top to bottom, yes siree Bob.